As I near the end of my time as a student here at Augustana, I am beginning to wish I had taken a page out of collegiate genius Tommy Callahan's (Chris Farley's character in "Tommy Boy") book and stuck around here for seven years instead of four. With graduation in May approaching far too quickly, I find myself reflecting nostalgically on my four great years on Augie's campus. Coming into college, I was a hometown kid searching for a comfortable, yet enjoyable college experience. Little did I know, Augustana would provide much more than a cozy and entertaining four years. Instead of allowing me to coast through my college career, Augie has challenged me into questioning, and thus strengthening, my faith, friendships, and overall philosophy on life. I have realized, through this special place, that the key to living happily is balance. It isn't tough to be balanced here, though, as juggling academics, athletics, and other activities is a daily task. In my time here at Augie, this ever-constant goal of balance has led to personal growth. On one hand, I've been challenged with an academically rigorous setting: something that is difficult at the time, yet so rewarding upon completion. On the other hand, Augustana is simply a fun community to be a part of. From athletics to events around campus to the people I've met, I can't think of a better place to live, learn, and grow as a person. Augustana is a community where time moves quickly only because there are so many exciting things happening on a daily basis. In the last six months alone, I have been lucky enough to meet the frontman for the Goo Goo Dolls, attend a guest lecture by Tim Westergren, the founder of Pandora Radio, speak with former U.S. Secretary of State Madeleine Albright, and I even sent a letter on behalf of our college to President Barack Obama, inviting him to the Nobel Peace Prize Forum. Opportunities such as these simply would not have come about had I went to some large university with thousands upon thousands of students. 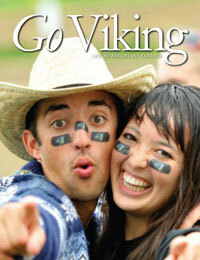 Being a student here, I am regularly reminded of how awesome it is to be an Augustana Viking. The liberal arts aspect of an Augustana education is shaped around the idea of living a life in balance. What other college would have given me the opportunity to study abroad four times during my four years of college? Thanks to Augie, I've been lucky enough to study Hinduism and Buddhism in India, business ethics in Norway, international economics in Australia, and Greek and Italian in, you guessed it, Greece and Italy. As a business and economics major, the liberal arts education I've received from Augie has given me the opportunity to amass a broad, worldly knowledge in areas outside of my majors such as religion, photography, and the sciences. Civitas, Augustana's honors program, has challenged me with the question of how to lead a responsible life through exciting and thought-provoking classes in history, drama, and economics. So, you may be asking how to lead this responsible life. My answer is balance, which Augie has given me through the liberal arts. As I'm sure many of my soon-to-be-graduating classmates are asked multiple times per day, I too encounter the question, "What do you plan on doing after Augustana?" To be honest, I really have no idea. President Oliver insists that I pacify those asking this question by responding: "I'm heading to San Diego to be a marine biologist." While I appreciate our President's keen advice, I can't lie. I have no plans of swimming with dolphins anytime soon. I do, however, have plans to better this world with the education I've received from Augustana. Am I worried or nervous about not having a job lined up yet for post-graduation life? Not at all. Augie has prepared me in more ways than I could have imagined to succeed in the "real world." My favorite part about Augustana? The people. Hands down. From professors to classmates and friends to the college's faculty, this campus has a special knack for attracting intelligent and friendly individuals who sincerely care about one another. In and out of the classroom, professors such as Dr. David O'Hara (Philosophy) and Dr. Sandra Looney (English) have become legendary around campus by dedicating their work to the growth of their students. As the student body president, I've been lucky enough to work with faculty such as Dean of Students Jim Bies and President Rob Oliver, and see first-hand how they work diligently to improve this already great place in which we live and learn. My classmates are incredibly bright, yet delightfully well-rounded. The relationships I will take away from this place will undoubtedly last a lifetime. For each of these friendships, I am very grateful. Thanks, Augie. If you are an Augustana alum, I imagine you miss this great place, just as I will in a few short months. If you are considering Augie as a future home: Go Viking and get excited because the time you'll spend here will be the best years of your life. If you're lucky enough to be here now, appreciate it; these four years fly by far too quickly to just sit along and enjoy the ride – get out there, get involved, and get a real taste of what Augustana has to offer. Finally, to my classmates who are graduating in a few months, let me depart with the wise words of Tommy Callahan: "Some of us are leaving, and that is sad, but this isn't the end. No way. We're gonna show this world a thing or two."